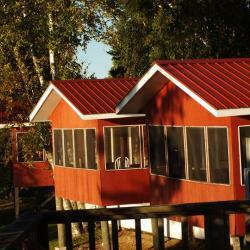 Birch Point Camp maintains 12 fully equipped cabins, all nestled among the birch trees overlooking scenic Northwest Bay, on Rainy Lake. Cabin capacities range from 1 to 3-bedroom units, each equipped with the modern day necessities and conveniences, to ensure that your stay is both comfortable and memorable. 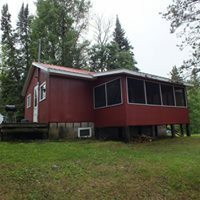 Each cabin also has a screened in porch (except cabins 11 & 12 which only have a shared outdoor deck), where you can enjoy your evenings, overlooking scenic Rainy Lake. In addition to your cozy cabin, our main lodge includes a convenience store, air-conditioned sitting room, and a newly added game room for you to enjoy. Many guests gather in the lodge and share fishing tales, play pool or cards, watch satellite t.v. or just enjoy the spectacular view of Rainy Lake from our front deck.